The survey finds that among Latino registered voters, Republicans may be more likely to turn out and vote than Democrats. Some 44% of Latino Republicans say they have given the election quite a lot of thought compared with 28% of Latino Democrats. This partisan gap is consistent with survey findings of the full population of registered voters. The findings for Latino registered voters emerge from a new national survey of 1,375 Latinos, including 618 registered voters, conducted from August 17 through September 19, 2010, by the Pew Hispanic Center, a project of the Pew Research Center. In recent elections, Latinos have also represented a growing share of the electorate. According to a Pew Hispanic Center analysis of Census Bureau data, in 2008 Latino voters were 7.4% of all voters nationwide, up from 6% in 2004 (Lopez and Taylor, 2009). When it comes to opinions of President Barack Obama, a greater share of Latino registered voters approve of his job performance than do all U.S. registered voters—63% versus 47%. 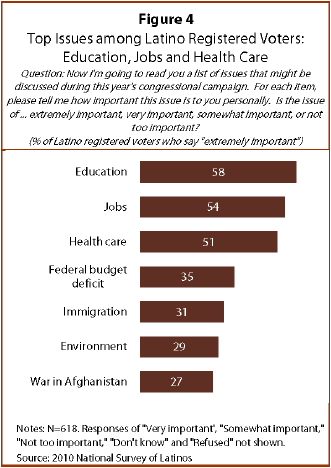 Yet when asked about the effect of his administration’s policies on Hispanics, Latino registered voters are divided. More than half (51%) say his policies have had no effect on Latinos, while one-in-four (26%) say they have been helpful to Latinos and 13% say they have been harmful. The new survey also reveals that the Democratic Party continues to hold a large advantage in party identification among Latino registered voters. More than six-inten (62%) Latino registered voters say they identify with or lean toward the Democratic Party, while one-quarter (25%) say the same for the Republican Party—a Democratic advantage of 37 percentage points. 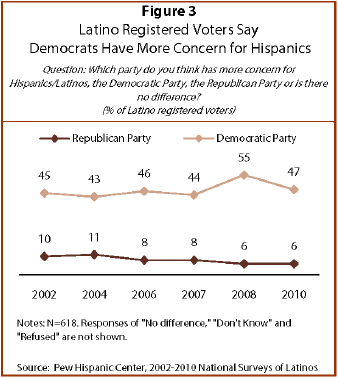 Democrats are seen as the party that has more concern for Hispanics. Nearly half (47%) of Latino registered voters say this about the Democratic Party—down from 55% in 2008, but similar to the share on this question expressed by Latinos for much of the past decade. In contrast, very few see the Republican Party as more concerned about Latinos than the Democratic Party—just 6% of all Latino registered voters and 18% of Republican Latino registered voters say this. The survey also finds that Latinos are less negative than other voters about the direction of the country. Six-in-ten (59%) Latino registered voters say they are dissatisfied with the country’s direction, while 73% of all registered voters say the same (Pew Research Center for the People & the Press, 2010b). However, the survey finds that two-thirds (66%) of Latino registered voters say they talked about the immigration policy debate with someone they know in the past year. It also finds that those who have had these conversations are more motivated to vote in the upcoming election than are those who haven’t. 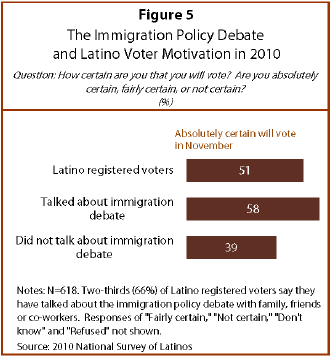 Nearly six-in-ten (58%) Latino registered voters who have discussed the immigration debate say they are absolutely certain they will vote in November, compared with just four-in-ten (39%) of those who have not talked about the immigration debate. Latinos are the nation’s largest minority group with an estimated population of 46.8 million in 2008, representing 15.4% of the nation’s population. Nationally 19.3 million Latinos are eligible to vote (18 years of age or older and a U.S. citizen) according to Pew Hispanic Center estimates, up from 18 million in 2006. Latinos make up 9.2% of the nation’s 211 million eligible voters. Two out of every three Latino eligible voters reside in one of four states: California, Texas, Florida and New York. This report is based on a nationally representative bilingual telephone survey of 1,375 Latinos ages 18 and older, including 618 registered voters. Interviews were conducted from August 17 through September 19, 2010. The margin of error for the full sample is plus or minus 3.3 percentage points at the 95% confidence level; for registered voters, the margin of error is plus or minus 4.9 percentage points. For a full description of the survey methodology, see Appendix B. Majorities of almost all demographic groups of Latino registered voters say they will vote for the Democratic Party candidate in their local congressional election Nov. 2. Only among Republican Latino registered voters does a majority (74%) say they will support the Republican congressional candidate. 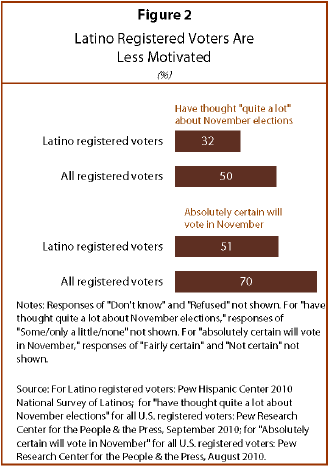 Some groups of Latino registered voters are more motivated than others to vote this year. More than six-in-ten (62%) of those who are ages 50 to 64 are absolutely certain they will vote, as are 61% of those who have at least some college education, 58% of those who are English dominant and 58% of Latino registered voters ages 65 or older. Fewer than four-in-ten (38%) of Latino registered voters who are Spanish dominant say they are absolutely certain to vote this year. This is lower than any other demographic group of Latino registered voters. Some six-in-ten (59%) Latino registered voters are dissatisfied with the direction the country is headed, down from 70% in July 2008 (Lopez and Minushkin, 2008a). Two-thirds (66%) of Latino registered voters say they talked about the immigration policy debate in the past year with someone they know. 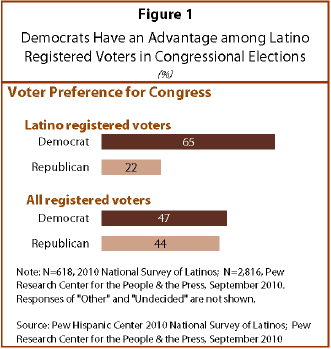 The 2010 National Survey of Latinos (NSL) focuses on Latino political participation and Latinos’ views of the upcoming congressional elections. The survey was conducted from August 17 through September 19, 2010, among a randomly selected, nationally representative sample of 1,375 Latino adults, 618 of whom report that they are registered to vote. The survey was conducted in both English and Spanish on cellular as well as landline telephones. Language dominance is a composite measure based on self-described assessments of speaking and reading abilities. Spanish-dominant persons are more proficient in Spanish than in English, i.e., they speak and read Spanish “very well” or “pretty well” but rate their English speaking and reading ability lower. Bilingual refers to persons who are proficient in both English and Spanish. Englishdominant persons are more proficient in English than in Spanish.